Russia builds Arctic air defence base. 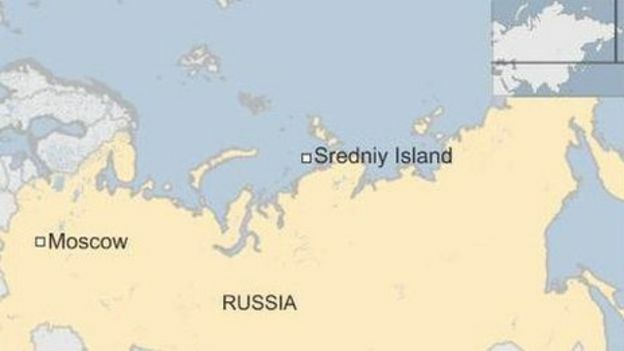 Russia has sent warships to an Arctic region where new naval infrastructure is being built, including an air defence base on Sredniy Island. An icebreaker carved a channel through the ice for the Northern Fleet flotilla, Interfax news agency said. Besides Sredniy, five island bases are being built by 1,500 workers - at Alexandra Land, Rogachevo, Cape Schmidt, Wrangel and Kotelny. Russia sees the Arctic as a strategic priority in its new naval doctrine. The fleet's vice-admiral, Viktor Sokolov, inspected the construction site on Sredniy, flying there by military helicopter when the flotilla reached the Kara Sea. During the Cold War the USSR tested nuclear weapons in the area. Russia says it is bolstering its forces in the Arctic in response to Nato expansion up to Russia's borders. Experts say the melting of Arctic sea ice - generally attributed to climate change - is making the polar seas more accessible for shipping. That could make it easier to prospect for untapped energy and minerals in the region.